When I arrived at the "do" shortly after 8.30pm, there were already a number of members and their most welcome guests tucked away in their favourite spots. I sensed the mood and atmosphere was good, despite the fact that the Villa had just knocked four past us to send us rock bottom, and that a good night's entertainment and craic lay ahead. It was after nine now and there was still no sign of the DJ. Kenny was panicking. Maybe like a lot of the members he wasn't going to show up. 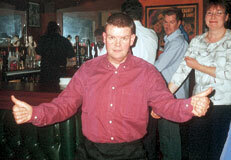 Were we going to have to listen to Gerry O'Keefe's jokes all-night I asked myself. Who threw that? Veronica was grilled about the whereabouts of the DJ, who also doubled as her "fella". A couple of phone calls later and the DJ's imminent arrival was assured. It was all hands to the pump to unload all the equipment from the van, and despite the intervention and close attention of the clampers, everything was connected in record time and we were off and running. The shortfall in Club Members actually present, was more than made up for by the number of guests who attended. Here I must especially mention a group of ladies from the Irishtown/Ringsend area who arrived as guests of a noticeably terrified Kevin Murphy and his wife Angie. I believe Kevin tried to fob them off by saying that all the tickets had been sold and suggested that maybe Temple Bar might be a better spot for them but Angie was having none of it saying Brannigans was the place to be. Well Kevin needn't have worried one little bit. 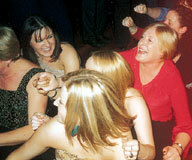 The girls were great craic and really got the party going by dancing and singing all night long. At this stage the place was rocking. The DJ was belting out some great sounds from Elvis to Westlife and the Manics to a packed dance floor. 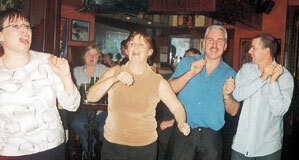 Those who could not fit onto the dance floor were busy tucking into a selection of sandwiches and sausages and chips. 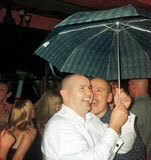 During one song "It's raining men", an umbrella was produced on the dance floor to the cries "Do you not think we have enough bad luck?". The offending item was quickly removed.
" I'm Forever Blowing Bubbles" which was followed by the members raising the roof with " We are bottom of the league, we are bottom of the league". Priceless. Then the raffle took place after a short delay as we had actually ran out of tickets. Unforgivable. The spot prizes supplied by the Members were snapped up to the usual cries of "Fix! Fix!" and still the banter and laughter continued. Where would you get it for a fiver? An hour or so later the masses shuffled out of Brannigans into the busy Dublin streets heading for the Taxi ranks and some even for alternative watering holes no doubt. 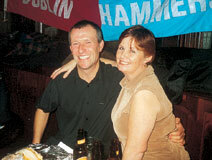 Thanks to Kenny Moran and the Committee for another great night and thanks also to the DJ and staff of Brannigans. Special thanks must go to our very own Veronica who once again played a blinder. Roll on next year!!!!!!! Thanks to Charlie O’Rielly for the report.